This building functions 100% like a Condo given there is no lengthy application, no board interview, no financial disclosure and no reference letters. Corporations, Foreigners, LLCs and Trusts are welcome. This is an easy buy/sell process with unlimited rentals allowed. 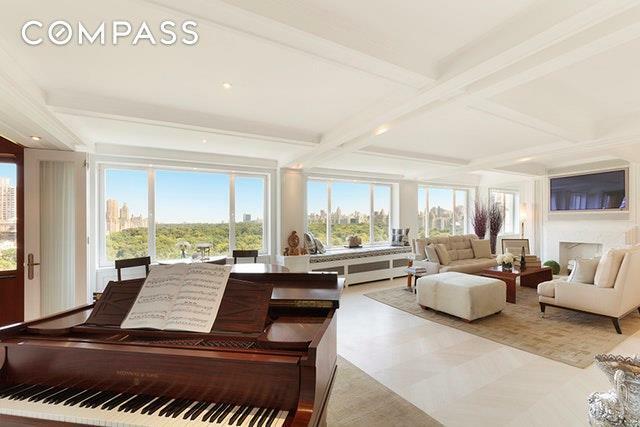 **NOT A LAND LEASEThis sprawling French Art-Deco penthouse home in a CONDO like building boasts breathtaking, direct & full panoramic Central Park Views with almost 100 feet of park frontage from all major rooms. 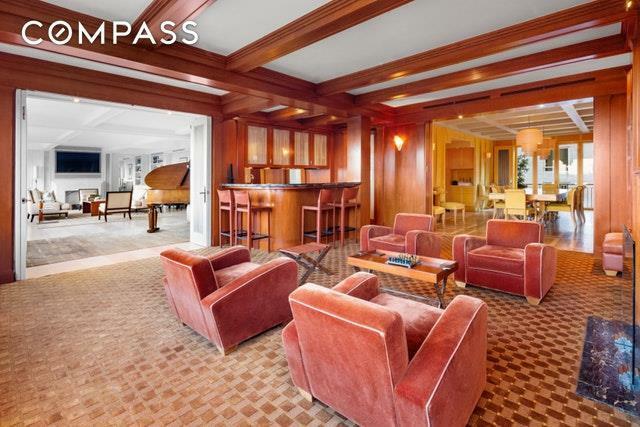 This one-of-a-kind 4500sf penthouse is newly renovated & restored as a luxury 1930s Ruhlmann-style mansion in the sky in a pre-war Art Deco Building. Upon entering the vestibule under the period piece onyx chandelier, the home opens to a large paneled foyer with semi-precious tigers eye mosaic flooring which flows into a ultra wide 37-ft living room on the park. 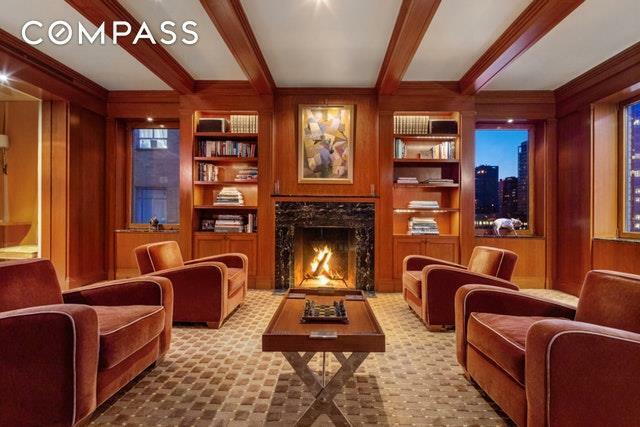 Adjacent to the living room is a large park-facing Anigre wood-paneled library featuring a fully outfitted wet-bar and the only wood-burning fireplace in the building housed by a limited Art Deco black & gold marble mantle and bar top. Directly off the library is a 23-ft long dining room with plastered coffered ceilings and seating for up to 20 people, a south-facing 50sf garden terrace, and easy access to a large eat-in kitchen with an island, diner-style banquet and top-of-the-line appliances. If you like to entertain, this is a caterers dream home with separate service entrance, food staging area, extra-large coat closet, full service cocktail bar, integrated sound system throughout the home and large 6 to 8-ft passage ways for the guests to move easily thru the entertaining spaces. The remaining rooms include an oversized 1000sf master suite on the park with a park-facing Jacuzzi & steam room, 3 additional bedrooms with en-suite bathrooms, 2 guest powder rooms and a laundry room. PH16 has been featured in numerous films, TV shows, documentaries, and photo shoots including NBCs 30 Rock with Whoopi Goldberg (EGOT), Showtimes Billions, HBO's The Duece, HBO series Vinyl with Martin Scorsese Directing on location, ABC movie Madoff starring Richard Dreyfus, Dreamgirls with Jennifer Hudson, Obamas re-election campaign video featuring Ricky Martin and 'Did You Hear about the Morgans' starring Sarah Jessica Parker & Hugh Grant. It has also played host to myriad charity and political events as well as several celebrity talent shows & performances. 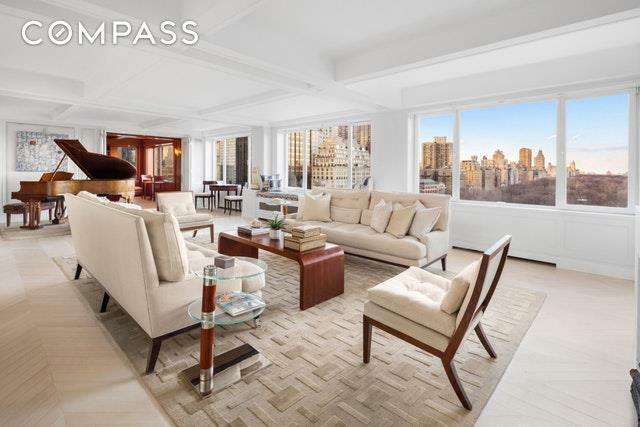 Southmoor House is a pre-war building situated directly across the street from Central Park steps from Columbus Circle and The Time Warner Center. The building has period marble faade & marquis, new mechanicals & infrastructure and a new gym. Pets are welcome. Due to the large cash reserves and No Debt, maintenance (including real estate taxes) is relatively low and stable at $7,830 per month ($1.74psf).